Are you looking to highlight a portion of your special event in an exciting, creative way? Then look no further than Confetti Blower rentals! Confetti Blowers are typically used for events with thousands of attendees, such as large corporate events, concerts, and political rallies. They can be used in conjunction with confetti cannons, or as a standalone effect. Of course, you already know the difference between confetti blower rentals and confetti cannon rentals – right? 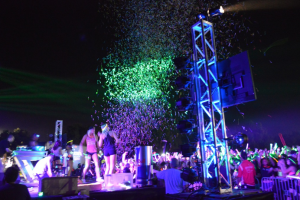 Confetti Blower rentals provide a unique special effect look for your live event. Rather than a single burst from a confetti cannon, a Confetti Blower is typically tied to a CO2 tank. This allows for a much longer special effect for your event – from 10 seconds, to the length of a song at a concert, or to the length of a parade. In fact, you can continue blowing confetti as long as you have compressed CO2. Our blowers can shoot confetti up to 50′ in the air, and at a rate of about a pound of confetti every ten seconds. Confetti Blower rentals truly bring the concept of confetti to the next level. Confetti Blowers can be used in both indoor and outdoor environments, and are loaded with tissue confetti in your choice of colors. But don’t stop there – Confetti Blowers can also be loaded with feathers, snow, or even UV reactive confetti for blacklight events! Confetti Blower Rentals require special effect experts! Confetti blower rentals – just like CO2 and Cryo effects – require a team of professional to implement correctly. These special effects use compressed CO2, which, in turn, requires a level of experience greater than compressed air tanks used for confetti cannons. As with any special effect, it’s important for you to use someone that has experience using all types of special effects and production services. At In Depth Events, we provide our special effects services for larger concert and corporate events all over the United States. Let our team of professionals to give you the look you envision for your event. Ask Us a Question about In Depth Events providing your Confetti Blower rentals!